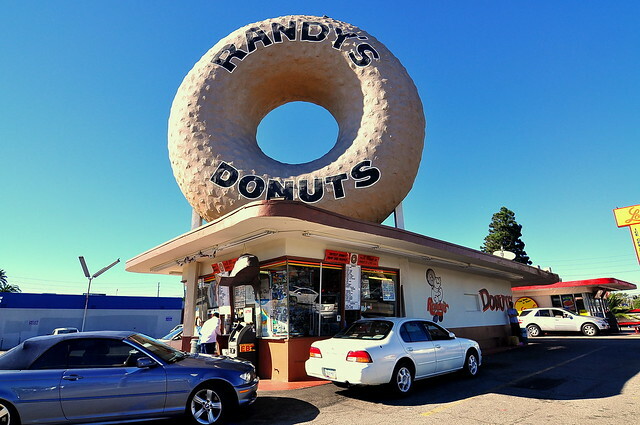 Randy’s Donuts is famous for the gargantuan, doughnut-shaped sign perched atop its building on the corner of Manchester and La Cienega Boulevards in Inglewood. Designed by Henry J. Goodwin, the shop was originally part of the now-defunct Big Donut Drive-In chain. For the past four decades, brothers Larry and Ron Weintraub have owned the 24-hour drive-through operation, maintaining the iconic signage with each passing year. The shop offers deep-fried classics like old fashions, twists, and jelly-filled, as well as “Fancies” like apple fritters and bear claws. All are reasonably priced in the neighborhood of one dollar a piece. For my inaugural trip to Randy’s, I brought along my friend Nastassia. Her passion for doughnuts rivals mine, so it was fitting that we visit this Los Angeles landmark together. The best-selling and best tasting doughnut was the yeast-risen glazed, a simple ring that reached for the sky and stretched with each bite. 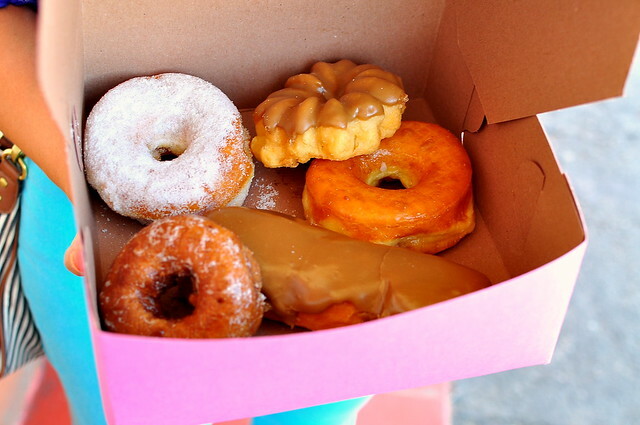 Also crammed into our pretty pink pastry box was a so-so maple bar, a solid sugared raised, a mediocre glazed cake, and a pathetic maple crueler. Not every doughnut at Randy’s was as impressive as the signage, but we really didn’t mind. Nastassia and I ditched the duds, savored the studs, and gazed giddily at that damn beautiful doughnut hovering above us. Have you been to the Donut Hole in La Puente? 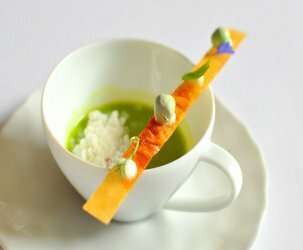 The quality of the pastry will probably similar to Randy’s, but the architecture is even more impressive! 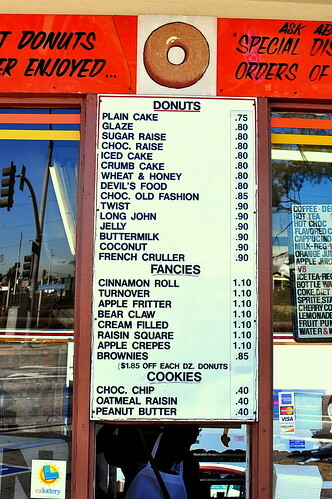 MRatito – Donut Hole is totally on the list…just gotta make it out to La Puente. Gotta love L.A.’s amazing architecture. 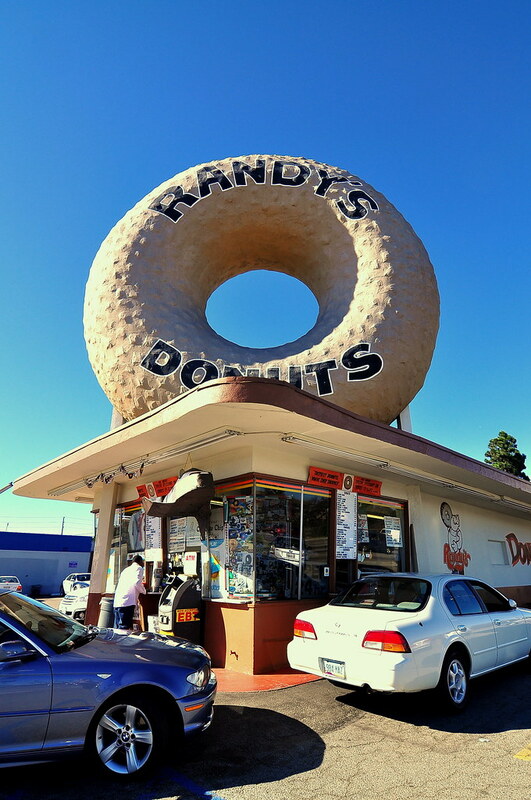 I used to live down the street from Randy’s… it’s all about the chocolate raised and the apple fritter! The chocolate on the raised is thicker, almost fudge-y, mmm. Hmm, for some reason, in the years I lived in LA, I never made it to Randy’s. 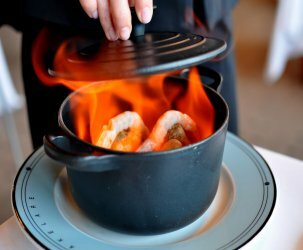 Clearly that was a mistake! 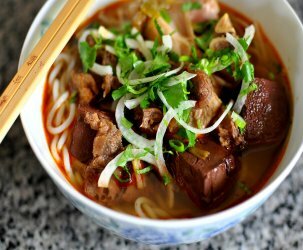 Ditched the duds, savored the studs – Your prose is a joy, Ms. Gastronomer!